An MSNBC panel laid into President Donald Trump's muted response to the arrest of a white supremacist accused of planning a massacre, with one panelist saying Friday that Trump wasn't happy with law enforcement for foiling the alleged attack. Coast Guard lieutenant and self-proclaimed white nationalist Christopher Paul Hasson was arrested last week on drug and weapons possessions charges, and investigators said he planned the killings of prominent Democrats and media members with the hopes of starting a race war. Trump said the situation was "a shame" on Friday and would be getting a fuller briefing, but he denied his rhetoric encouraged Hasson. "Deadline: White House" host Nicolle Wallace said it gave her no pleasure to see Trump fail the leadership test on this issue. She castigated him for tweeting about things like the Jussie Smollett case—she said the actor accused of perpetrating a hate crime hoax did something "inane"—and ignoring Hasson. NBC News reporter Heidi Przybyla said the Justice Department had buried the news of the arrest, and NBC News reporter Carol Lee noted Trump didn't thank law enforcement for its efforts in apprehending Hasson. 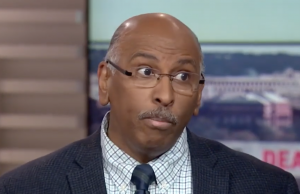 Former Republican National Committee chairman Michael Steele said his "glass was no longer half full," saying he wasn't surprised a self-proclaimed nationalist like Trump would fail to speak out against a white nationalist. "These are his people," Steele said. "He's not going to thank law enforcement, because he's probably not happy about what law enforcement did." "Is that where we are?" Wallace asked. "That's where we are," Steele said, saying he couldn't be hopeful that Trump would mature in his presidency. "That's a brave thing to say," Wallace said. "Let me just draw you out on that. If he'd carried out his attacks, what do you think the president would have done?" "That's the next test in all of this," Steele said. "That's a very good question, and it's absolutely the next test, because we can sit here and honestly say we would hope that there would be the appropriate level of outrage and pushback and all hands on deck … I don't know what he would do, and that's the sad spot about all of this."